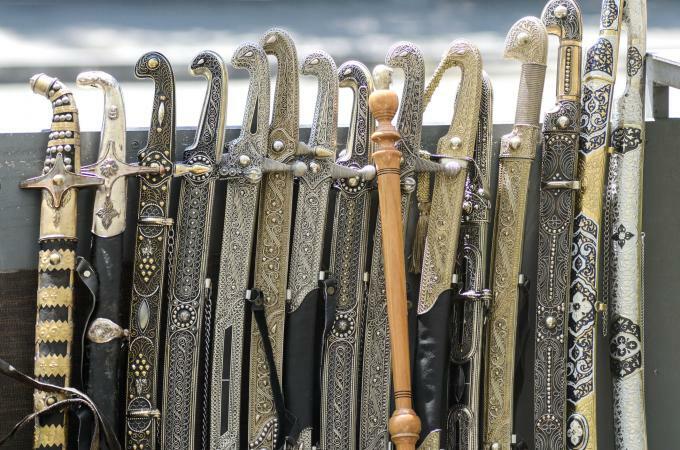 Collecting antique swords is a popular, worldwide hobby and a good investment; the value of swords grows at an average of 20 percent each year. New collectors should, however, build a solid foundation of knowledge about antique swords before they start their collection. The sword is rich in history and was the weapon of choice in Europe, African continents and Asia for centuries, long before it was popular in America. Sword manufacturing dates back to 3700 BC, when copper mining began in ancient Egypt and Anatola (Turkey). The vast number of swords, types and styles manufactured by ancient civilizations through the 19th Century makes it impossible to identify all, but below are some of the primary swords used during that time period. Prices for authentic swords can range from $100 to $6.5 million. This massive gap in value depends on the condition of the piece, the age, purpose for which it was used and its rarity; for example, according to an article from the Washington Post, the last sword used by Napoleon sold at an auction in France in 2007 for $6.4 million. This was one of the highest prices paid for any sword on the market. Information about is available about prominent sword smiths and manufacturing plants between the eighth and fourteenth Centuries is limited. However, the highest ranking European sword makers and plants that were in high demand were Germany and Italy. Prominent sword makers most likely left hallmarks or signatures on their work. Marks will vary from maker to maker. No specific bladesmiths were found, just manufacturers in two sections of Germany. Blades were incised with a wolf running, which signified a superior blade. There are two parts of a sword, the blade and the hilt. 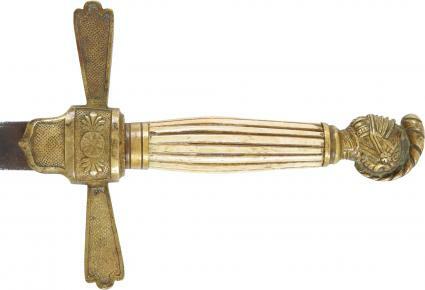 The hilt is the upper part of the sword attached to the blade. The sword evolved through the centuries; parts were added and developments made to improve handling, sharpness, length of the blade, and embellishments to signify military rank, social class and country of origin. 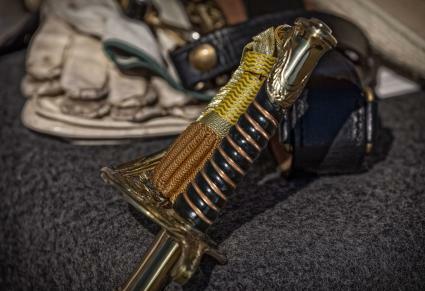 Dealers and experts who classify or describe swords have diverse opinions. 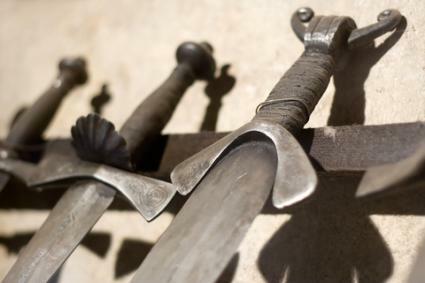 The evolution of ancient swords is so complex it can be mind-boggling to the new collector. Weapons originally made as cutting swords may have changed to a cutting and thrusting sword in another era or country. Experts can look at a sword and know the time period from which it came, but mistakes are still made by the most knowledgeable. Ewart Oakeshott, renowned Medieval sword historian, wrote a brilliant typology that is used as a classification guide by most appraisers. 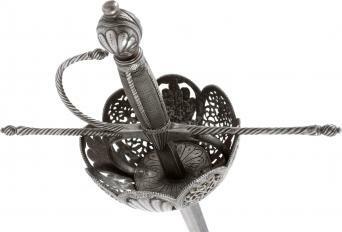 Length range: 30" to 45"
Handle length: 10" to 15"
Handle length: 18" to 21"
Modifications in the 17th Century created a new version of the Rapier, the Smallsword; the country of origin was determined by the style of the hilt. A Calvary Confederate, Dog River model 1840 Saber ca. 1840 is valued at $4,315 in Kovels' online price guide. The Katana Japanese Samurai Sword made in 800 AD, is the most sought and can cost hundreds of thousands of dollars on the market; it can't compare to any other sword in history. The curved blade averaged about three to four feet long and the hilt size ranged from eight to twelve inches. The blade was made from hundreds of thin layers of the purest steel, with no imperfections. The Katana's blade is the sharpest of blades, with a balance of perfection. Numerous Katanas were brought to the U.S. after World War I. Bill Blake, sword maker and owner of Sword-Site, shared a historical perspective regarding the value of antique swords. Blake says that in regards to their demand, "European swords were sophisticated both in terms of the physics they employed, and also their metallurgy - and that is coming to be appreciated." Swords can be very expensive. Blake noted that almost all European Swords were destroyed or cast into the sea at the demise of its master, which makes any find rare and costly. Blake opined that the overall price for European swords is more reasonable than Japanese and Chinese pieces and a far greater variety in type and design. Viking swords are very hard to find in one piece; only a few were made. Christie's Auction sold a Viking Sword with an Ulfberht inscription for $18,418. Joyeuse is the sword of French Kings; The Sword of Charlemagne can be seen at the Louvre in Paris ca. 10th to 11th Century. This sword is the most reproduced today. Japanese Swords from the 13th Century made by Go Yoshihiro, the most famous sword smith in history. The estimated value range from Bonhams Auction is between $150,000 to $175,000. The easiest and most available sword to collect are 19th and 20th Century military swords; they are affordable, easy to identify, forgeries are few, and most are in good condition. The best advice for you as a new collector is to learn as much as possible about the kind of sword for which you are interested; go to auctions and dealers, handle the swords, talk to vendors and collectors. Once you acquire knowledge, you'll be ready to begin your crusade into the world of sword-collecting. Randy McCall commented in his article, The Art of Cutting, that as a whole, the same process is used to identify blades from all parts of the world. The list below is a collective opinion of sword collectors, and dealers. Learn about blades before you make a purchase. Know your blades, the purpose for which it was used, its origin, and hallmarks (signatures or maker's marks) and where it was manufactured and swordsmith, if applicable. Study and handle blades at auctions, antique fairs, museums and shops, view eBay auctions. Focus on one type of sword and master it. Most collectors specialize in just one area due to the number of variations. There are several sword experts and dealers who have published information about antique swords; Harvey JS Withers, dealer of antique swords and edged weapons has a series of helpful guides about European Swords; the Metropolitan Museum of Art has a free online selection of journals written by curators and experts, and house one of the largest exhibit of arms and armor. Blake's website, Sword-Site, is known as the world's largest online sword museum, and provides information on over 800 swords with descriptions and photos. Dealers are listed in all parts of the world, but the safest option is to buy from a reputable, licensed dealer who will give you a certificate of authenticity and guarantee; however, this is not the most cost-effective. Reach out to dealers and vendors, feel them out; are they friendly, do they know the merchandise, do they respond in a timely fasion? Use your instinct; it is always spot on. Online auctions; Collectors Weekly lists current eBay auctions. 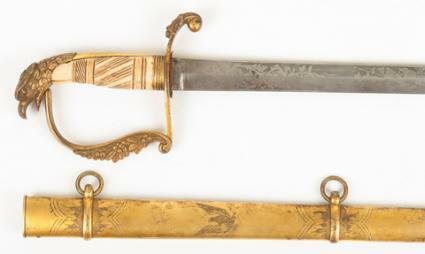 LiveAuctioneers.com represent numerous auction houses; you can view a variety of antique swords. Dealers/auctions can be found in every part of the globe. Blake says, "The only true way to tell a good fake from a genuine antique is to utilize the expertise and personnel of a metalograhpical laboratory." Science will provide collectors with a definitive answer versus an educated guess from someone knowledgeable about antique swords. However, if you are not spending thousands, or hundreds of thousands of dollars, here are a few tips to give you an idea of what to look for when you classify your sword's authenticity. 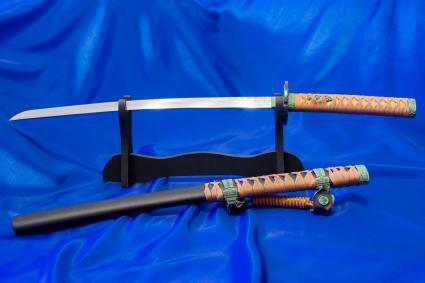 Put your thinking cap on: The Katana Samauri Sword measures anywhere between 3 feet to 4 feet, if you see one at an auction, listed as authentic but the length is only 28", be suspicious. McCall's article notes that collectors shouldn't base the evaluation of their swords to replicas. Metals used to produce blades were different from materials in use today. Modern forgers lack the skills and craftmanship of past sword makers. 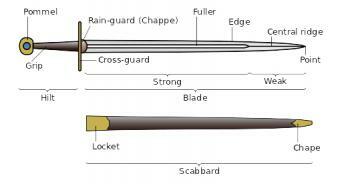 The blade should not be bent and the hilt should be tightly fastened to the blade; if it feels loose, it could signify that the blade or hilt have been replaced. If the blade has been cleaned, it may be damaged; this will decrease the value. If it doesn't have a matching scabbard, the value will decrease. Match the sword with the time period; the blade and hilt should be consistent with the model, time period and country of origin. Collecting antique swords is an interesting hobby and lucrative investment, however, the classification process is extremely complex. One sword could have over one hundred variations and several names. Dealers and collectors alike agree that you should begin with one time period or one type of sword and learn everything possible, before you dive in. Once you have a solid foundation of knowledge, you will be ready to enter your historical adventure into sword collecting.